Southeast of Alameda Island was a very handsome bridge designed by TY Lin. 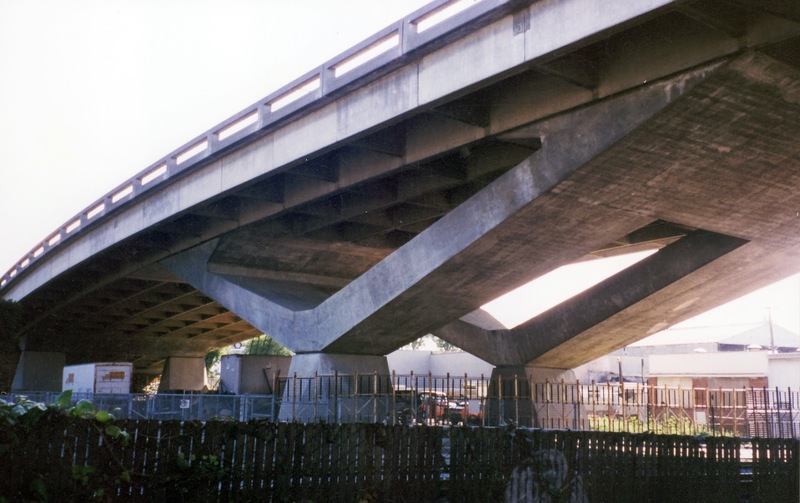 The Hegenberger Road Overhead celebrates the ability of concrete to take on a myriad of shapes while floating effortlessly in the air (see photo above). Unfortunately, it appears that some rehabilitation work on the bridge has made it far less attractive (see photo below). Alameda County, California Bridges: Hegenberger Road OH across the UPRR (1) by Mark Yashinsky is licensed under a Creative Commons Attribution-NonCommercial-NoDerivatives 4.0 International License.